As part of our ongoing efforts to provide you with the most efficient and accurate service in recording and filing documents with the Mercer County Clerk’s Office I am pleased to announce some upgrades to our e-Recording Service. 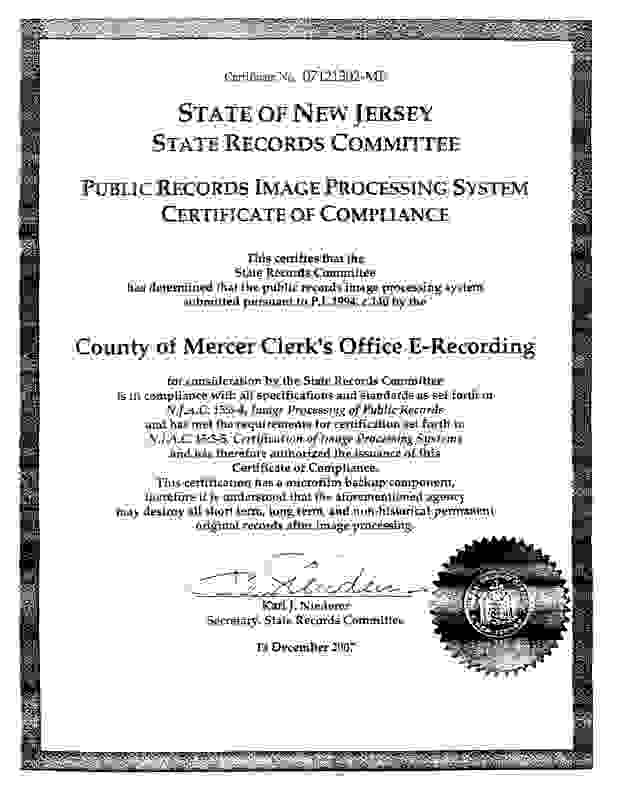 If you search the website, www.njcountyrecording.com, you will find that there are new features, new pictures and upgrades to the system that make it easier to record property documents electronically. Our goal is to allow total electronic recording of real property by anyone who wants to become a user. Generally, our most frequent users of this service are banks, title companies, law offices and mortgage companies, but anyone can use it. Plus, this portal is also used in 12 other New Jersey Counties. So, once you learn to use it in Mercer, you can use it in any of the other counties (all listed on the website). The e-Recording service and our other online search services are free with registration. However, several counties are beginning to charge a $2.00 per document fee for e-Recording in order to keep up with maintenance costs, and Mercer is contemplating this as well for the near future. Level I allows the submitter to create an electronic cover page (Document Summary Sheet) which is then attached to the original document and submitted for recording. After the document is received by the County Clerk’s office, recording and indexing occurs almost immediately and the recording information is automatically available here on this site. The documents are then scanned and verified and returned to the sender within days. Level II will include a scanned image of the document, supplied by the sender, along with the Document Summary Sheet. Recording & indexing will take place as usual and the recorded image is returned to sender with all recording information electronically stamped on it. All information can be tracked on this web-site. As we continue to progress, Level III will be true electronic recordation for discharge of mortgages and certain other documents. Our goal is to provide the best possible service to submitters in Mercer County and to all the people of New Jersey to make the recording process as timely and efficiently as possible. •	Mercer County offers a unique County-wide Property Information Portal with GIS satellite views that contains information from our tax office, the County Clerk’s Office, the planning division, and other administrative offices. The portal can be accessed at http://pip.mercercounty.org/. We encourage all interested users to register. •	As our office continues to scan older books and maps into digital format for online users, I will work with the County to add more records to this portal and make more records accessible . The Mercer County Clerk’s Office also maintains a property website with other types of documents which are not accessible through GIS or not part of the E-Recording portal. However, it contains the majority of our records dating back to 1958. That can be found at https://records.mercercounty.org/RecordsNG_Search. Please feel free to reach out to my office at (609) 989-6465 or 609-989-6061, or check the COUNTY CLERK’S website at www.mercercounty.org if you have any questions about our services. We will do our best to assist you. 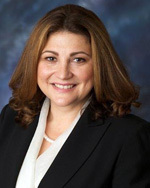 Paula Sollami Covello, Esq., is serving her third term as Mercer County Clerk in New Jersey, having been re-elected in 2015. Ms. Covello is an Attorney-at-Law. She spent the majority of her career working in government, first in the New Jersey Governor's Office as a Policy Advisor and in the NJ Department of Education, serving as the first Executive Director of the New Jersey School Ethics Commission and legal division. As Mercer County Clerk, Ms. Covello has made many positive and innovative changes to her Office. She brought in electronic recording by joining a statewide e-filing portal, and implemented a new land records management system that allows for online accessibility of her County’s land records. This year, her office combined forces with other offices in her County to offer more records to the public with GIS satellite view, including tax records and planning division records, all with one click. She eliminated a recording backlog in her office within her first year of taking office. Further, her work to preserve historic land documents by back scanning them put an end to a lengthy lawsuit against Mercer County. She has also expanded passport services by offering them at her County’s satellite office in Hamilton Township six days per week, and has taken passport services to various municipalities throughout Mercer County. She’s also increased vote-by-mail participation throughout Mercer County by increasing outreach. Ms. Covello graduated from Villanova University with a BA, where she double majored in English and Communication Arts. She earned her Juris Doctor degree from New England School of Law in Boston, Massachusetts. Ms. Covello has been strongly involved with the International Association of Clerks Recorders, Election Officials and Treasurers for ten years. She has served as director at large of the Recording Division, where she presented many innovative and interesting topics on Recording such as MERS (where she was able to bring in the President of MERS to the annual conference in Louisville, KY), Sovereign Citizen threats, Title Plants, Geographical Information System (GIS), Document Restoration, and other cutting-edge technologies such as Marriage and Property Recording Kiosks. She also served on the Clerk’s Committee for IACREOT for 8 years, where she was a featured panelist on E-Recording at its Atlantic City conference in 2011. The Mercer County Clerk is active in civics and in her community, having served on the Lawrence Township Planning Board and on many community boards.